Mary Shelley is a 2017 historical romance movie directed by Haifaa al-Mansour, starring Elle Fanning as the titular character – more specifically the Frankenstein author’s first romantic relationship to poet Percy Bysshe Shelley (Douglas Booth). While the film was applauded for the Fanning performance and the 19th century production values, many critics seemed to think it watered out the fascinating life of the author, as well as the gothic backdrop of the cornerstone novel that helped define a genre. The film does not yet have a Norwegian distributor, so this author has been unable to see it at this point. Amelia Warner is perhaps best known as a British actress, having starred in such films as Mansfield Park (1999), Quills (2000) and Æon Flux (2005), but she launched a musical career under the moniker Slow Moving Millie in 2009. 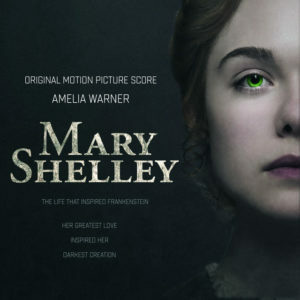 She made her feature film score debut with Mum’s List in 2016, but Mary Shelley is certainly the first score that has put her on the map as a composer; a more fullbodied orchestral work that showcases an emerging talent. Since the film is not about the gothic horrors of Frankenstein and more about an intimate, romantic relationship, it makes sense that the score is slow-moving, ethereal and beautiful. The music is firmly planted within romantic post-minimalism and is mostly a monothematic affair, but the various permutations and orchestrations of the central theme is what gives it forward momentum – mostly through undulating piano, strings and soaring alto voices. The haunting, lullaby-like main theme gets its full statements in tracks like «Mary Shelley» and «Mary’s Nightmare» – while it takes a back seat to more shimmering string colours in tracks like «Storm in the Stars», «Mary’s Decision» or «We Left This Place». The quasi-minimalist piano figures connoting youthful innocence are highlighted in tracks like «My Sanctuary», «Rights of a Woman» or «Caged Bird». These three main elements constitute the backbone of the score. While the soundtrack album occasionally runs the risk of sounding somewhat ‘samey’ due to the similar atmosphere fluttering around the same tonal range, the 39-minute running time makes it a succinct and envelopping listen from start to finish. When it isn’t purely romantic, it alludes more to the mystery of the character and her surroundings than any visceral discomfort. As such, it comes off more as a soft, exploratory tone poem with deep melancholic undercurrents. It’s not a score that blows you away in its ingenuity, but it’s one of the best listening experiences of the year so far.